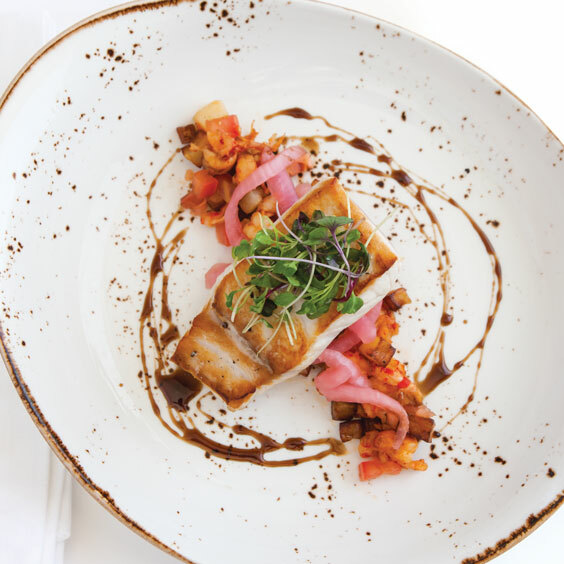 2016 Chef to Watch Lyle Broussard’s menu at Jack Daniel’s Bar & Grill at L’Auberge Lake Charles features bold barbecue dishes and fresh Louisiana seafood, like the amberjack he uses in this recipe for Pan Seared Amberjack. 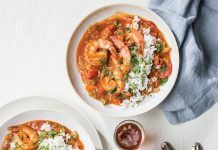 He makes his own tasso—a highly spiced chunk of cured meat—which he pairs with shrimp, smoked Cheddar grits, house-made Louisiana-style barbecue sauce, and Creole slaw for his popular shrimp and grits. In a medium saucepan, heat Abita Bayou Bootlegger, vinegar, and cane syrup over medium-high heat; cook, stirring frequently, until reduced to a thick syrup. In a large saucepan, heat oil over medium-high heat. Add onion, and cook until tender. 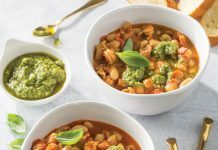 Add potato, capers, garlic, ½ teaspoon salt, and ½ teaspoon pepper; cook until potato is tender. 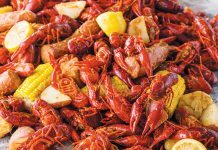 Add crawfish, and cook until heated through. Set aside. Pat amberjack fillets dry with paper towels. Season with rosemary, thyme, remaining 1 teaspoon salt, and remaining 1 teaspoon pepper. Heat a large skillet over medium-high heat until just smoking. Add butter, and cook until hot. Add amberjack, and baste with butter from pan until cooked three-fourths through. Set aside. Add arugula and tomato to potato salad. To serving plates, add potato salad, and top with Parmesan and amberjack. Drizzle plates with cane vinegar syrup. Garnish with arugula and lemon juice, if desired. Root beer may be substituted.